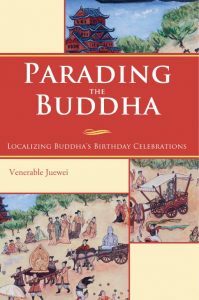 In the book Parading the Buddha Venerable Juewei examines Buddhist acculturation – how a tradition adapts to a new culture – through the lens of Buddha’s Birthday celebrations. Her research brings to life historical accounts of grand Buddha image processions during the Northern Wei dynasty around the resplendent capital Luoyang, then the largest city in the world, and how they changed the politics, relationships, and religious imagination of the people. ‘Parading the Buddha – Localizing Buddha’s Birthday Celebrations’ will be available for purchase at the Buddha’s Birthday Education Project marquee during the Darling Harbour celebrations, and from the Nan Tien Temple bookshop in Wollongong. I had the great privilege of observing the process by which Venerable Juewei’s research was accomplished. The resulting publication comes at a moment when it can be of genuine value to the field of Chinese Buddhism. She undertook the task by examining all of the facts about the time and the place of a singular event. She then sought to find the character and condition of her subject and to test its quality, validity and function. Under usual circumstances, a parade would be subordinate to all other information. However, she was able to transcend the restrictions of the field and reassess the method by which one chooses a topic. She then went forward, revising the governing principles of this activity. In this way, the work has shown us that depth of research can be applicable to any idea, proposition, or text. Judging such effort should always be focused on how the work has developed a theme. The selection of “parade” as a theme for serious historical study of the Northern Wei dynasty placed a great burden of proof on the author. This approach had to be seen in comparison with all the previous treatments of the period and the place. Fortunately for us, the task was completed in a fashion that draws our attention to the quality of the exploration, and the final execution that is described in the completed work meets all of the demands of the highest form of scholarship. Histories are all too often filled with overworked topics and, as a result, lack freshness in thought or design. In the case of Venerable Juewei’s research, a compelling story is told about a subject that is seldom discussed. She has approached this with force and enthusiasm. The “parade” is normally a subordinate thing, seen as being less important and holding a less conspicuous place or status in the scheme of the historical account. It requires unusual force of argument to effect a shift in attitude about the acceptable list of research topics of historical study. I believe that this volume has accomplished the feat of bringing the “parade” into our line of vision. In many ways, this was a daring endeavour but the adventurous approach has become a distinguished endeavour, in the face of great difficulties and even oppositions. It is not exaggerating to say that she has triumphed and achieved much through the strength of the investigation process and the dexterity which allowed inclusion of material from a wide range of methodologies. Buddhist monastery and meditation hall, this volume shows us the public venue with celebration, color, crowds, and sumptuousness. It is a side of Buddhism that is seldom studied and we are indebted to her for this extensive and accurate study of one such event.